You don’t have to spend much time at the housing estate in North Melbourne before you come across someone who wants meaningful work but can’t get it. The problem seems to be getting worse, especially amongst young people. I’m worried that rising youth unemployment is hitting our area hard and threatening what’s good about our suburbs. One of the things that makes Melbourne great is our diversity, with people from many different backgrounds and incomes living together as neighbours. However, for many young people, including those from refugee and migrant backgrounds, it has never been harder to get a meaningful job. While we should be making sure everyone in Melbourne feels like they belong, we’re instead seeing many young people who feel excluded, unable to find a job and forced to live below the poverty line on the dole. On the latest figures, youth unemployment in Australia is sitting at 13.6 per cent, more than double the national average unemployment rate (which is currently 6.1 per cent). Whilst we’ve been lucky to avoid the spiralling levels of youth unemployment seen in other parts of the world, with countries like Spain and Greece experiencing levels well over 50 per cent last year, some groups are much worse hit than the national average. I’ve heard many stories from locals who’ve completed degrees in Melbourne and sent off dozens of job applications but not even received a call for an interview. However, when they change their name from ‘Fatima’ to ‘Anne’ on their CV, the phone starts ringing. The statistics back up these experiences. People from refugee and migrant backgrounds are one-and-a-half to two times more likely to find themselves un- or underemployed. Combine that with a rising youth unemployment rate generally and it paints a worrying picture. Add to this the Abbott Government’s proposal to boot young people off the dole and the funding cuts to TAFE and universities and it’s a recipe for disaster. The government hopes to wash its hands clean of the responsibility to support these young people, leaving it up to charities to provide housing, food and clothing to the young unemployed who are not lucky enough to have the support of family or friends. As well as fighting the Abbott Government’s attacks, I’ve been working hard to help get jobs for locals in our neighbourhoods. A few years ago, we brought together community leaders, businesses and job service agencies to tackle the issue. We set up the Melbourne Employment Forum, an association led by the local African-Australian community, to help find jobs for locals. I’m thrilled that we have just secured funding from the Melbourne City Council for projects to help find meaningful work for locals in North and West Melbourne. We all have an interest in making sure Melbourne is a neighbourhood where everyone feels they have a place. More jobs for our neighbours means everyone feels happier and prouder. There’s a lot more that needs to be done, including national action to grow the clean economy and create new jobs in areas like education, health and renewable energy. In the meantime, we’re making a start locally. If you can help with a job for a local, please get in touch with my office on 9417 0759. 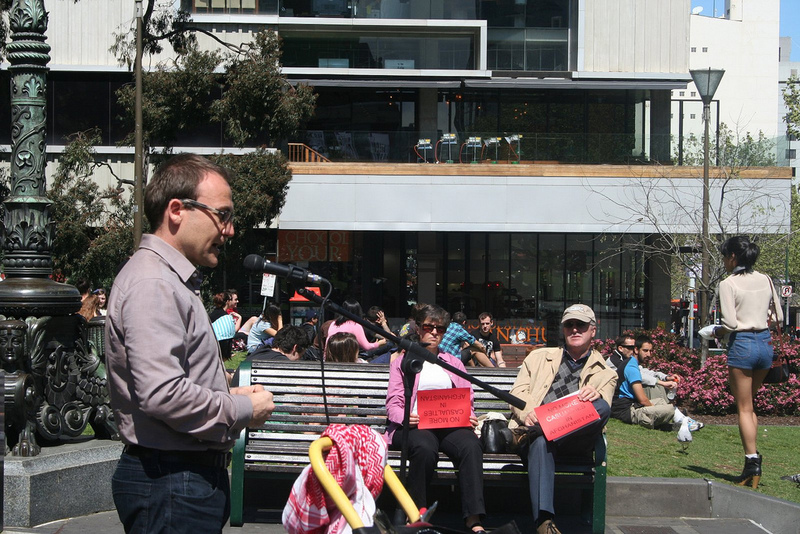 Adam Bandt is the Greens Federal Member for Melbourne.